DD+D leverages theatre techniques and acting methodology to help designers empathize with users and produce better results for their clients, as well as to communicate and collaborate around design solutions. Theatre is a fun, informative, and effective way to work out ideas, visualize concepts, and communicate solutions. It allows teams to empathize, by stepping into the shoes of users. It can reveal how people interact with services, products, and each other on a physical, emotional and intuitive level. DD+D offers theatre-based workshops customized for each stage of the design process and tuned to the specific needs of designers, design teams and their clients. Helping to engage with and communicate design research. Supporting testing and evaluating of new ideas. Supporting testing of existing concepts and services. The design process starts with the designer. The Design Empathy workshop helps designers acknowledge their biases and challenge their assumptions. Understanding these potential blocks will help you to connect with your customers, team members and stakeholders. Learn how actors, the world's greatest empaths, use acting methodology to understand Self before stepping into the shoes of Others. Reconnect research to personas. We take two-dimensional representations of customers and bring them to life. Participants learn to use acting techniques to connect to the hidden needs, motivations, and goals of users. Make data memorable. This session uses a method of problem identification and solving to translate ideas and opportunities into physical experiences explored through improvisation and role-play. Bodystorming uses a design brief, props and simple costumes to give a sense of place. The process is designed to uncover how relationships between people, locations, and things affect ideas in ways that brainstorming alone cannot. Rapid prototyping at its best! This session is similar to a theatre rehearsal. Using an existing scenario this session tests how users interact with low and high fidelity products or services. Designers act out scenes based on user’s problems identified during the research phase to step into the shoes of the user in the context of a particular touch point or day-in-the-life. Participants learn how to use their embodied insights to create rich contextual scenarios. This workshop encourages designers to think differently about the products they design. Designers play the role of the product as they interact with users to understand what users want from an experience with a product. Participants explore creating products that are deferential, forthcoming, and perceptive. Learn to design good product behavior. DD+D Team Members, led by Byron Stewart, bring expertise in: UX, interaction, product, and service design, ergonomics, HCI, and business. Theatre, improv, storytelling, facilitating, directing, acting. is an actor, director, consultant, facilitator, and presenter, and is owner of Dramatic Diversity/DD+D. For the past ten years, Dramatic Diversity has provided theatre-based corporate training and diversity & inclusion consultation to clients including BP/Amoco, Hewitt & Associates, Motorola, Northern Trust Bank, Brookfield Zoo, Ohio State University, and PepsiCo. Byron has also applied theatre-based techniques to the design field facilitating persona/scenario, performance testing, and design empathy workshops for Critical Mass, RTC, IIT’s Institute of Design, DePaul University, Columbia College and for Northwestern University’s Design for America Fellows. 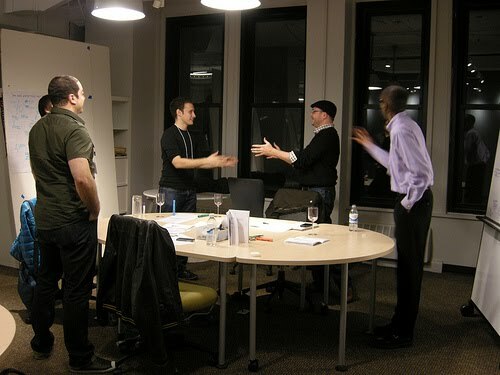 Byron has facilitated bodystorming sessions for Sears and Walgreens, and is a local leader and presenter for Chicago’s Interaction Design Association. Byron was service design consultant on the development and launch of a new diabetes class for University of Chicago and coordinator of the Chicago Service Jam. Articles on Byron’s workshops have been featured in the UXmatters and Experience Matters online magazines. He received his BFA degree from Howard University. Please click here for a complete downloadable version of our brochure !